As the recognized leader in the design and manufacture of custom information packaging our capabilities are virtually unlimited. Whether it is custom materials, custom sizes, or custom designs we have the technical staff to turn your ideas into finished product. Our graphics and manufacturing expertise are second to none. We encourage you to call with your needs and specifications. This type includes a variety of products that are offered by us. 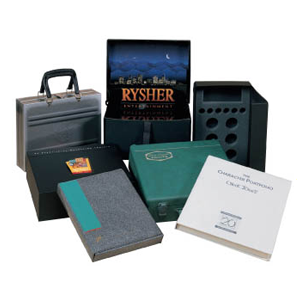 We offer custom packaging options for products such as polyethylene and polypropylene bags, catalog binders, E-device covers and packaging, and various types of boxes.